Color LCD meter offers the ultimate in visibility. 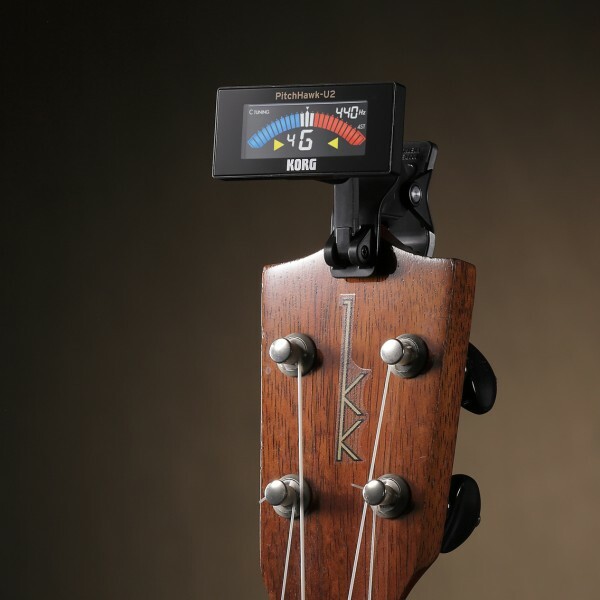 KORG's clip-style tuners can be attached directly to the headstock of your instrument. Improving on the already popular PitchHawk, the PitchHawk-U2 features a new high-brightness high-contrast color LCD display that allows you to tune with unprecedentedly high visibility. The body has also been made even slimmer, improving both design and functionality. 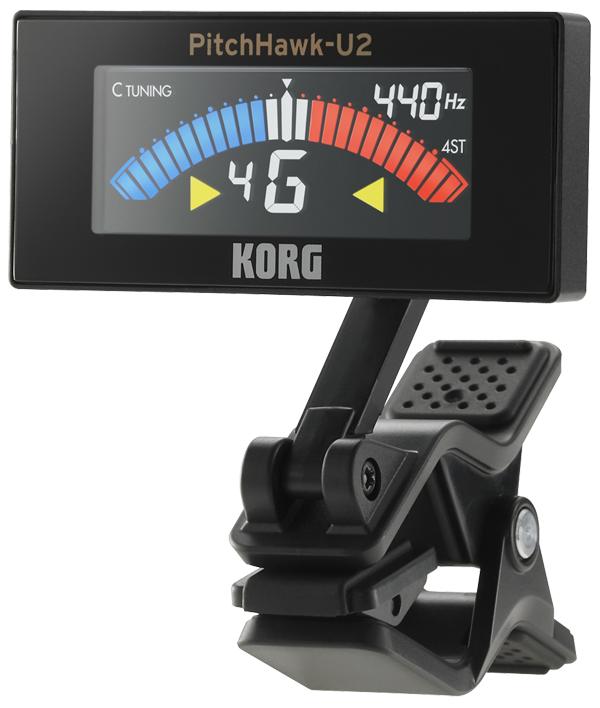 These new models represent the evolution of clip-style tuners, while maintaining the high-precisions tuning that you expect from KORG. Advanced color LCD provides a new dimension of visibility. A slimmer, easier to use design. Tuning modes for all types of ukuleles, large and small. The high precision and sensitivity that you expect from KORG. A clip mechanism that provides strong holding power as well as flexibility. Calibration, auto power-off, and memory backup functions. 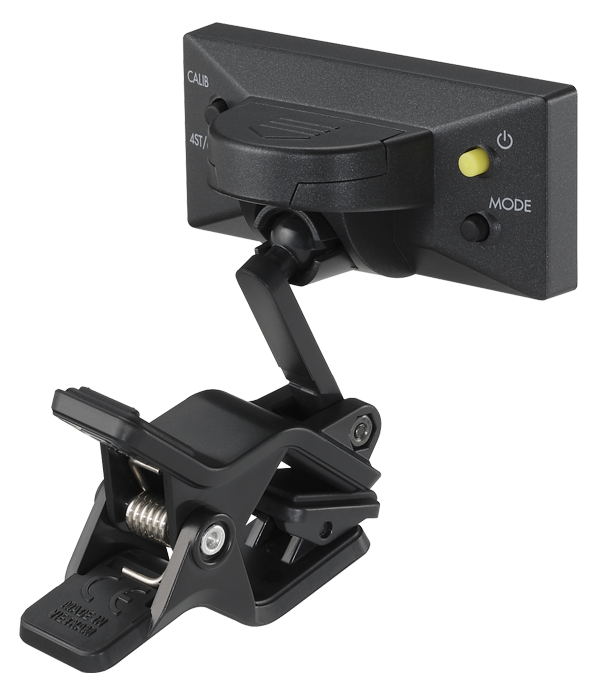 In the first for KORG's clip-type tuners, these models feature a color LCD display. A high-brightness white backlight and an extremely clear color VA meter provide high contrast and a wide viewing angle. In addition to improving visibility, the text and the meter display are color-coded for dramatically easier recognition. Rather than having to "watch" the meter, the performer merely has to "sense" it; these models allow instant recognition of your tuning status. The body is slimmer and more stylish than ever. The battery holder and buttons have been moved to the rear surface of the tuner in order to improve functionality and reduce size. Such attention to detail is particularly important for compact products such as these units. Improved design also leads to improved usability. Slimming-down allows the PitchHawk-U2 to fold completely flat, allowing convenient storage in the pocket of your gig bag or case. The four buttons on the rear surface are positioned left/right/up/down for intuitive operation even when out of sight, simultaneously satisfying the requirements of both functionality and design. Tuning modes that support any ukulele, large or small. 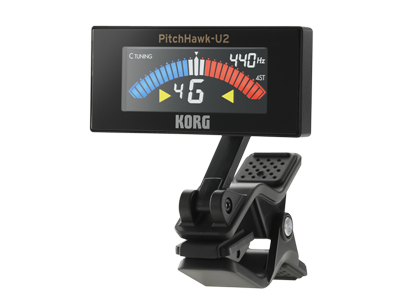 Several modes are provided by the PitchHawk-U2: Chromatic, C tuning (*1), D tuning (*2), and Baritone (*3). You can also select the number of strings: 4ST (*4) or 6-8ST (*5). You&apos;ll be able to perfectly tune any ukulele, large or small, and there&apos;s even support for Low-G tuning. All of these options are sure to let you enjoy solo performance over a wide range of tunings. When it comes to clip-type tuners, one may expect convenience to be emphasized more than accuracy. However, when time is of the essence, like when you're on stage, high accuracy and sensitivity are mandatory. Since creating the WT-10 - the world's first needle-type meter tuner - in 1975, KORG has accumulated a long history in tuner development, making it uniquely able to deliver the high accuracy and sensitivity that’s provided by the PitchHawk-U2. As you can see from the immediate response of the meter when you play a string, the wide range of detection from low to high notes, and the piezo pickup that accurately detects only your instrument, even when playing with a band , it’s apparent that KORG has not made any compromises with the PitchHawk-U2. As on the previous models, the clip is designed to make the connection as efficient as possible, ensuring a firm grasp. The PitchHawk-U2 firmly adheres to various shapes and sizes to accommodate the headstock of your ukulele. Even if you move around actively while performing, there's no danger that vibration or weight will cause the tuner to shift. The double mechanism of a movable arm and ball joint simultaneously provide both durability and a free range of angle settings. Players have the flexibility to position the tuner wherever they need, and the confidence that it will stay in that position. A variety of functions are available to support your tuning endeavors: the calibration function allows a variety of concert tunings, the auto power-off function saves the battery if you forget to turn the unit off, and the memory backup function preserves your settings even when the power is off.